Lusan has engaged Media Empire's web design arm, e-Wok, to rebuild and keep updated their home page as well as build a new online retailer, Kool Fun Toys. I would like to take this opportunity to commend the exemplary service offered by Warwick Holt of e-Wok. 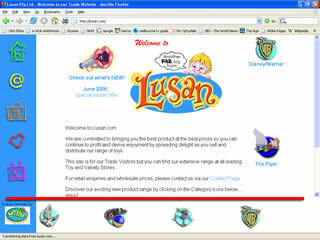 Thanks to his efforts, our website www.lusan.com looks professional and attractive and operates smoothly. His input and suggestions have enabled our site to be considered as one of the most progressive in our industry. Whenever the need arises Warwick is available to assist in working on our site helping our company operate efficiently and to budget. e-Wok not only provides the appropriate level of service but also delivers this service at a very acceptable price. I congratulate Warwick on the skills he has assembled and the service he delivers.